How to get education loan in India? You are here: Home / Education Loan / How to get education loan in India? 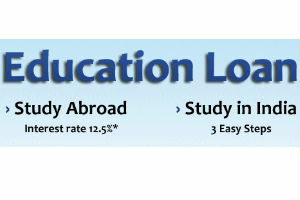 Want to know how to obtain education loan in India? This article shows you how to get education loan in India for pursuing studies in India or abroad. It also shows you what are the requirements from the student side and how the process actually goes right from finance assistance till repayment. You are eligible for education loan in India once you meet these criteria. You should be of Indian national and you should not be a minor. The age limit in most of the banks is between 16 till 26. Next you should have secured admission for a technical course/professional course as per the eligible course listed by the bank through entrance test or through selection process either in India or abroad. Once you meet the eligibility criteria mentioned above the next step is to find the appropriate bank which meets your requirements. You can do this by search and compare. Here is the list of some best banks. There are list of factors which must be considered while looking for a bank which provides you appropriate funds to pursue you education. Some of them are maximum loan amount sanctioned by the bank, interest rates, the repayment period, security etc. Collect all the details regarding the study loan, the terms and conditions. Then find the bank which suits your needs. For example the interest rates vary from bank to banks. So select a bank with low interest rates. Once you are done with the selection of bank the next step is to approach the bank for loan. This can be done in two ways. One is by visiting the bank in person or by applying online. You need to produce your letter of admission to the bank. The other documents which are required are identity proof, address proofs, your age proof, income certificate of your parents probably the pay slips for the past few months, if you are opting for education abroad you may also required to submit PAN (Permanent Account Number) card, your fee requirement slips, security related documents if required (normally asked by banks when the loan amount required is above Rs. 4 lakhs), marks sheets of the qualifying examination, passport size photographs etc. The list of documents may vary from bank to bank. However the list mentioned here are almost wanted by most of the banks. Once the bank approves to sanction you the loan, the next step is you need to submit the list of expenses that will be required for the current year. The bank analyzes the slip and then issues the amount directly to you institution. After your graduation, there will be a period of time called moratorium period which includes your course period+6 months to 1 year of time for you to acquire job. Once this moratorium period is completed you need to start paying your interest. If you cannot pay the loan amount within in the time some banks may even extend your repayment period. But this is not the case in every bank.